These lamps are gorgeous! I ended up sending them back because they were bigger than I expected. I didn’t look at the measurements closely enough when I purchased them. In my opinion, these would look best in a living room or on a long dresser. I tried to put them on nightstands beside the bed and they were just overwhelming. My nightstands are 32” across and the lamps seemed to eat most of the space. The quality of the lamps was great and I am truly disappointed they didn’t work in my space. The look of the lamps could easily fit farmhouse or beachy decor and appear as though a skilled decorator thoughtfully selected them. 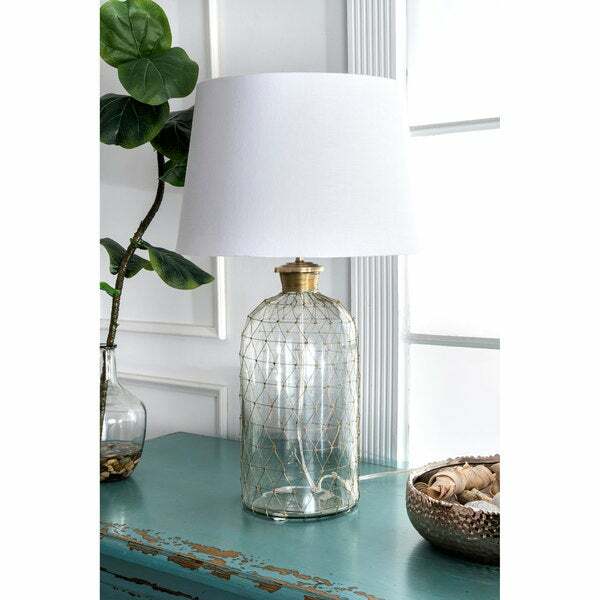 Let your room shine with the addition of this modern, 31-inch high, Glass & Iron table lamp. It has a Cotton shade that delivers bright ambient lighting. Add an vibrant flair to any room with its Clear finish.